/ Posts Tagged "medical missionary"
Receptive Hearts or Guiding Hand? 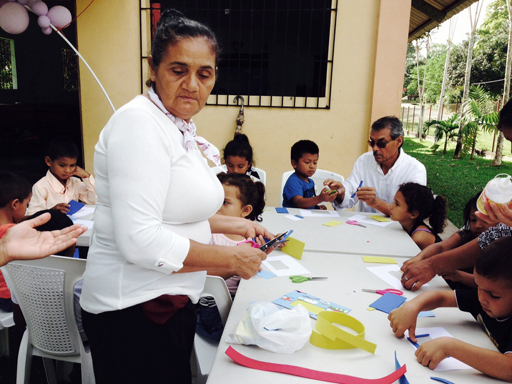 Ministering in Panama through a Vacation Bible School and medical missionary work. Here at Living Springs, we feel privileged to be alive at this time in Earth’s history. Even amidst challenges, God is in control and we can lift up our eyes because our salvation is near! Two girls enjoying Vacation Bible School. 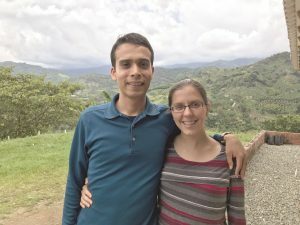 As first elder of our local church, my husband Pablo has been making it his goal to encourage church members to develop a closer relationship with God. We realized last year that since most of our church attendees are children, we needed to get more involved in children’s ministry. 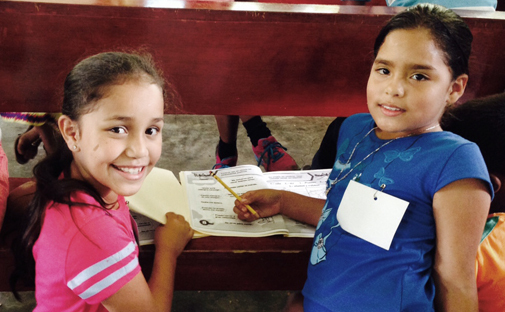 When the school break came, we held a Vacation Bible School, with about 44 children attending regularly. They made an enthusiastic crowd, joyfully singing Bible songs and listening to the Bible stories. It was a blessing to see young minds attracted to our Savior! God provided extra help for Vacation Bible School. One family that attended is a missionary family from another denomination that we have been giving Bible studies to for some time. When we invited their children to the VBS, the parents not only accepted, but asked if we needed help. We did need extra hands, so we put them to work with the sister from our church who was in charge of the food. They seemed to really enjoy the VBS, and one day the mother commented that one of her boys had told her that he had the Bible songs playing over and over in his head. I just smiled and said, “That is the idea!” She agreed. We continue to feel God’s guiding hand in our medical missionary work as well. With many cases, we know that only a miracle can truly heal the patient. Such is the case of Diana, a 64-year-old with severe rheumatoid arthritis, who despite having visited many specialists and naturopaths still suffered from pain so severe she could hardly sleep. After assessing her, we placed her on a simple fruit diet, showed her how to do hydrotherapy treatments, and told her about God’s health laws. Above all, we spoke with her about the mind and the effect that thoughts and feelings have on physical health. We gave her a list of Bible promises to claim as she put the health program in practice. For more informatin, see here. Working at the health fair. At this, Diana opened up and talked about the many disappointments she had had in life and how they may have contributed to her health problems. It seemed that no one had talked to her about these issues before, and she kept saying how thankful she was for our talk. At our next visit she had a smile on her face. She told us she felt better and that she knew it would take time but that she trusted God to help her recuperate her health. When a group of students from Uchee Pines Institute came and put on a health seminar about an hour and a half away from us, we took the opportunity to help put on a health fair. Some of those attending were people that God had already placed in our path to instruct in the health message. Now they had come back to learn more! The Uchee Pines seminar went so well that we hope to work in conjunction with another ministry to follow up with more health seminars in the churches of this conference. As we move forward in faith, knowing that the end is near, we pray that we may all be found faithful and at the end of our journey be able to say, “Nevertheless I am continually with Thee: Thou hast holden me by my right hand. Thou shalt guide me with Thy counsel, and afterward receive me to glory.” Psalm 73:23, 24. Pray for the children who attended the VBS and for the missionary family that is searching for the truth. 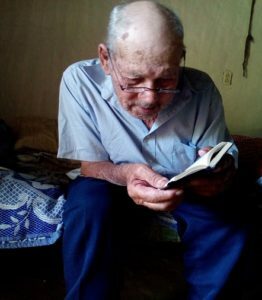 Pray for the Actostas’ medical missionary work, including the health seminars, that people may be healed both physically and spiritually. 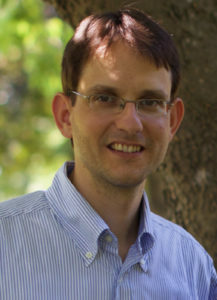 New outreach coordinator strengthens hands-on evangelism at SETI. “True education is missionary training. Every son and daughter of God is called to be a missionary; we are called to the service of God and our fellow men; and to fit us for this service should be the object of our education.” The Ministry of Healing, 395. Outreach coordinator, José dos Santos Jr.
Equipping young people to win souls to the Kingdom of Heaven—this is the purpose of a missionary training school, and this is the purpose we strive to keep in the forefront at Santo’s Evangelistic Training Institute (SETI) in Brazil. Recently, we have added an outreach coordinator to our staff to strengthen our hands-on missionary training program and make sure students have an effective evangelistic program to participate in as part of their coursework. We want them all to have the chance to go out and witness with close supervision and guidance, and our outreach coordinator, José dos Santos Jr., has seen to that. Since he came and began working with the students and the communities around SETI, 68 people have begun studying the Bible with him and the students! 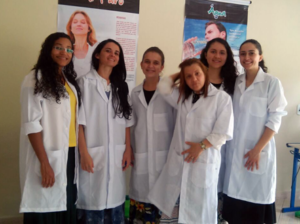 On March 12, José and the students put on a public health expo in the nearby community of Melgaço. Here the students practiced much of the knowledge they had been learning in the Health Evangelism Training Program. 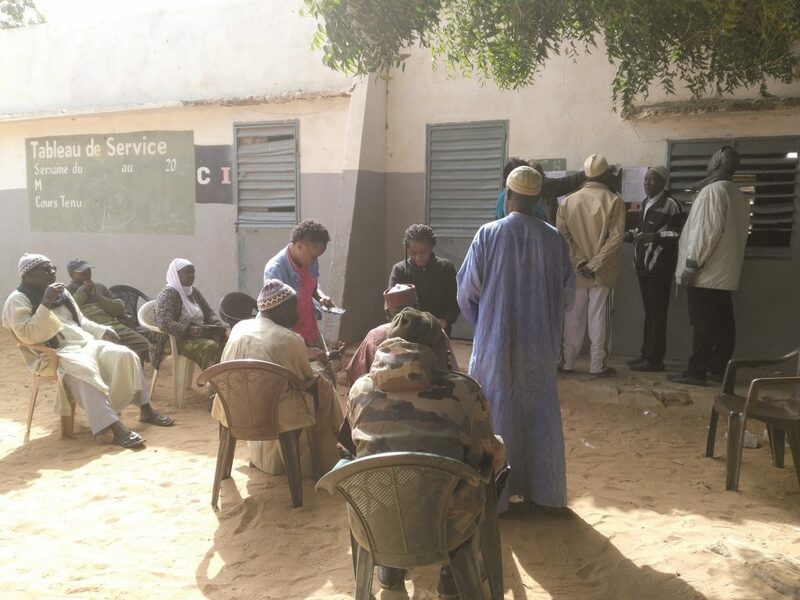 They presented the eight laws of health, checked people’s blood pressure and glucose levels, gave chair massage treatments and distributed literature. 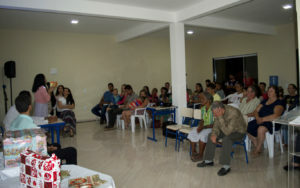 They also made several contacts for the evangelistic series which was to begin the following day. By mingling with people and taking care of their needs, they very effectively prepared the ground for the evangelistic series! With great expectation, we waited to see who would show up for our meetings. 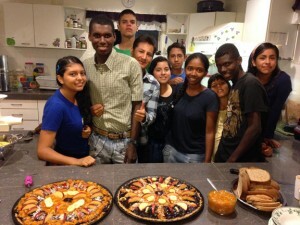 The first night, 18 non-Adventists attended. The following nights the numbers grew until we had an average of 30 non-Adventists attending. In our next update, we will have news about how many people made a decision for Christ at the end of the evangelistic series. 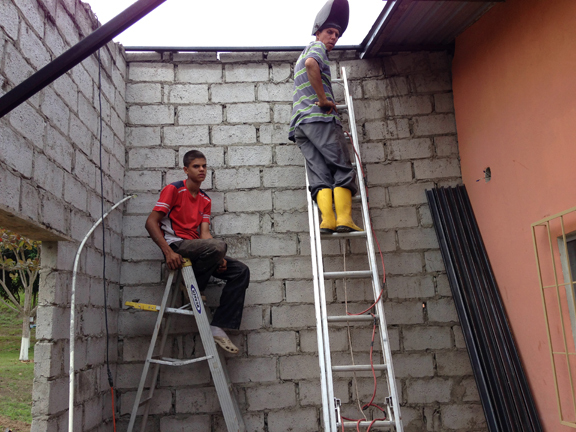 We hope to be able to establish a Seventh-day Adventist church in Melgaço this year! Our school’s evangelistic efforts fulfill several purposes: winning souls for Christ, training the students and supporting the mission of the Seventh-day Adventist Church. In this sense, the educational program itself is evangelistic—not just the activities of the outreach department. Over the years, non-Adventists have enrolled in the academic programs and as a result of their studies have joined the Seventh-day Adventist Church. 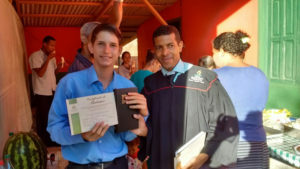 This year, Emanuel Coutinho came to SETI to deepen his experience with God and to develop his talents for service. Emanuel had been in the Seventh-day Adventist Reform Movement since birth, but had not been baptized yet. 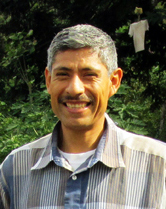 Because of SETI’s friendly Christian environment and the Bible studies he went through during the training course, Emanuel was able to identify the true church of Bible prophecy and decided to join it. On February 19, 2017, Pastor Antonio Costa Silva baptized Emanuel into the Trincheira Seventh-day Adventist Church. Emanuel’s story is just one example of how SETI is fulfilling God’s purpose for a missionary training school, both in leading the youth to Christ and making them useful for service. Counsels to Parents, Teachers, and Students, 495. May SETI always fulfill this divine mission! Pray for effective missionaries to be trained at SETI and for souls to be reached through their evangelistic efforts. Give. Last year, SETI built a multipurpose building and a new kitchen/cafeteria in order to receive more students and accommodate a lifestyle center. To pay for these projects, SETI borrowed $15,000. Your donation to Mission Projects International marked “Brazil—SETI” will help pay off this loan. “As long as our schools have debts which were incurred in their establishment, in the erection of necessary buildings, and in providing necessary facilities, it is our duty to present the case to our brethren and ask them to lessen these debts.” Testimonies, vol. 6, 207. 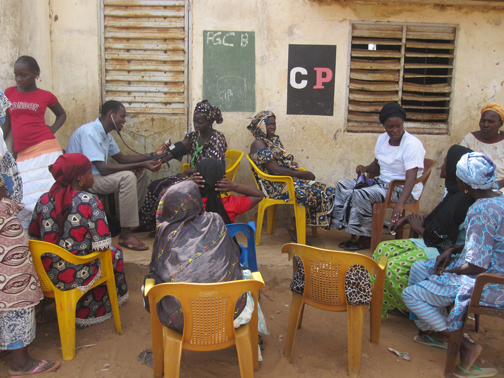 Medical missionary opportunities abound in the Muslim mission field of Senegal. Blessed peace to you from Senegal, the land of heat and sand. Situated next door to the Sahara Desert, Senegal receives frequent deposits of Saharan sand via the harmattan winds that blow along Africa’s Atlantic coast. Add to that the sand used for the never-ending construction projects, and sand ends up everywhere: in the houses, on the roads and cars and often in your mouth and eyes. in the Muslim mission field of Senegal. Imagine this blowing sand mixing with the excrement of street-roaming cows, sheep, goats, feral cats and dogs and the mentally ill homeless population, along with the trash dumped in vacant lots, and you have a recipe for disease. 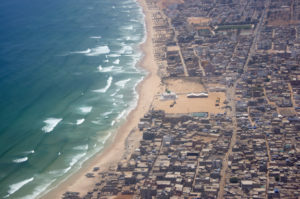 Filthy sand accounts for many of the eye infections and flu-like illnesses rampant in Senegal and especially in Dakar. In such an environment, immune health becomes vital! Medical missionary opportunities abound in a place like this. Recently a sister from church made some lifestyle changes to address her health issues, but after changing her diet she developed debilitating headaches and dizziness. I went to visit her and ended up giving her a fomentation and counseling her on nutrition. Realizing that she was probably anemic, I suggested she get an iron supplement and some vitamin B12. A week later, her dizziness and headaches had completely subsided. 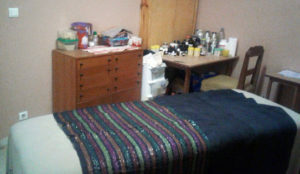 The treatment room for Deborah’s medical missionary work. Running to her bedside, I found Sophie having trouble breathing and struggling to retain consciousness. I immediately started praying and asking God what I needed to do. Looking up “asthma” in my Natural Remedies Encyclopedia I found that eucalyptus oil could help. Propping her up to a sitting position, I rubbed some eucalyptus oil under her nose and then put some oil in an inhaler and told her to breathe as deeply as she could. I could tell it was painful for her at first but I kept encouraging her to breathe. My husband wanted to take his niece to the hospital but she refused to go. I asked her if we could pray for her, and praise God, she accepted. After the prayer, I mixed eucalyptus oil in some massage oil and massaged her chest and back. Heating a fomentation pad, we wrapped it in some towels and had her hold it on her chest, then moved it to her upper back. We also made a hot foot bath and put in some grated garlic and eucalyptus oil. During this time, I also kept giving her cayenne tincture to help the blood circulate. It took about 40 minutes before she could breathe without a lot of pain. After an hour she could say a few words in a low voice. I kept praying and asking God to help her and He did! Praise His name. When she was able to speak better, Sophie explained that she didn’t want to go to the hospital because she believed their treatment was deadly. She had seen me work on Janie and preferred natural treatment. “God is our refuge and strength, a very present help in trouble.” Psalm 46:1. We can always count on Him! I pray that we all will learn His natural remedies so we can be a blessing to our family, friends and neighbors. 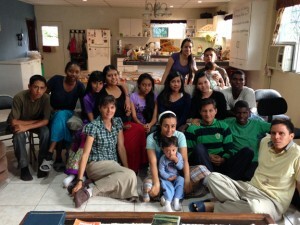 Pray for Deborah’s Muslim family and friends to open their hearts to Christ as she seeks to share the gospel with them. In 2016, you donated $1,420 to the work in Senegal. Your donations helped build up the ministry outpost and furnish Deborah with natural remedies to help friends and neighbors. God blessed your gifts! Five families begin holding Sabbath services as a result of one couple’s desire to share. It all started when the Lord placed a burden on the hearts of Sister Dolores and her husband Orlando. Dolores had been raised in the faraway village of San Manuel, and she wanted her friends and loved ones to hear the present-truth message she had come to hold dear. She approached the church about her desire, and a little over a year ago the youth began visiting San Manuel to offer blood pressure checks, pray for the sick and organize Vacation Bible Schools and other children’s activities. 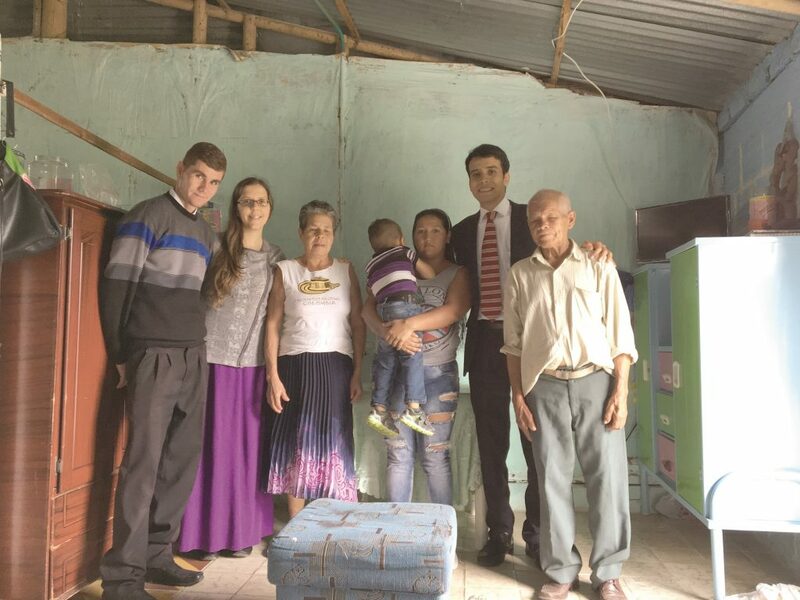 Finding the people very open, the La Zona Church sent Brother Douglas Bravo to conduct an evangelistic meeting in the old school building, with several church members going along for support. God gave success! More people attended than we expected, and the community invited us to come back. Now, different church members go every week to share in this beautiful mountain village. We provide health education, natural remedies, baking classes and basic treatments such as wound care. Before launching into Bible study, we always include a five- to ten-minute health capsule, and the people seem to really enjoy the information. They tell us that our teaching is different from what they hear at the local Catholic and Evangelical churches. They say they had never been taught the importance of taking care of their health. As a result of our efforts, five families are receiving Bible studies and holding Sabbath services at the little schoolhouse. Some have mentioned their desire to be baptized! It’s a wonderful experience to see people accept the gospel of Jesus—to see people’s hearts being touched by the love of God. We go to share the peace, hope and love of Jesus, but we receive so much more in seeing the villagers’ eagerness to learn about this last-hour message. We hope and pray that we can send a full-time Bible worker to San Manuel both to teach the people and to train a leader from the local community who can help other souls prepare for Christ’s coming. When I meditate on the great need in San Manuel, tears flow from my eyes because these sheep have no shepherd. Until now, they have never been taught about God’s everlasting love. As we share with them, we also plead with God to cause His Holy Spirit to impress their hearts to surrender to our Savior. We know God hears our petitions, because rain or shine people always come out and listen as we share Bible truth. We present the simple gospel truths without criticizing their engraved beliefs. We just want to let people experience Christ’s love as we share of ourselves, our means, our time, our resources and our talents. Our hearts have been touched by the great need in San Manuel. They have churches, they have religion, but they lack a personal relationship with a personal God. They lack the knowledge of the Scriptures, the power of God’s Word. We want to help them connect and commune with God so they can obtain Christ’s character and prepare for His coming. May God give us more faith to share the present truth in every mountain and village within our reach. Pray for the village of San Manuel. Join the La Zona Church in petitioning for a full-time Bible worker to be sent to this village to teach the people and train up a leader for them. If you would like your donation to support the work in San Manuel, please send a note indicating your desire. We are growing here at Pra del Tor! From the time that we first arrived, our dream has been to provide a place where young people could prepare to be medical missionaries. We wanted to offer them an atmosphere where they could come in contact more easily with the Fountain of true wisdom through nature and His Word, away from the bustle of the cities and the false system of education. We have had a few youth come and stay with us over the years, one or two at a time; but our training center never expanded into anything larger, no matter how we tried. And so, busying ourselves with the farm and other projects, we accepted that it must not be God’s will for this place. Now we are beginning to see that the Lord has His time for everything. Those years of solitude as a family prepared us to fulfill the work that our Heavenly Father had in mind for us! Our own children have grown into adolescents who can now help shoulder the work and, most importantly, be a living testimony of God’s true education. Some of our young people. People ask us how we screen the young people that come, or what is our selection process to make sure we don’t accept youth who will do more harm than good, and negatively influence the others. To be honest, we leave that up to the Lord. We simply pray and ask His will in the matter. We have set up guidelines for the young people’s stay at the farm, and so far, the “troublemakers” and those who aren’t interested in following our standards have left of their own accord within a week. We want to remain a family and not turn into an institution, so we bring the young people into our home and treat them as our children with the same correction, encouragement and privileges. They all have responsibilities in the work schedule, classes, outreach, etc. God is blessing! One recent Sabbath afternoon, I went walking with my youth (all eleven of them) and three young people from the surrounding area. We set off to a village about half an hour from us, enjoying the vigorous exercise and the cool breeze. Along the way we stopped at some small wood houses and called out to the children playing underneath. At first, they all ran and hid, peeking shyly from behind sacks of dried corn and piles of bricks. However, when we started to sing about the wise man and the foolish man, showing them all the actions and hand motions, the children ventured out. Before long, they were right in the middle of everything. They shrieked with delight when we told the story and sang the song about David and Goliath, especially since my son Caleb, the tallest of the group, demonstrated the part of the big, gruff Goliath, complete with his swaying and tumbling to the ground. As I continued with the story of Jonah, I noticed some of the adults in the house sitting near the upper windows, pretending not to be interested. Then, when I lowered my voice in the story, they leaned closer to the windows, trying to hear. We told numerous Bible stories and sang a song about each. Then we said our goodbyes and started towards home. “Are you coming next Sabbath?” a frail little girl shouted as she waved from the stairway. One of the young ladies turned to me with teary eyes. “I’ve never had such a happy Sabbath in my whole life as a Seventh-day Adventist.” This young woman, age 18, comes from the capital city of Quito. Initially, she was quite reluctant to come live with us, but she came for “three months” to accompany her younger sister who was eager to come. Now the older sister doesn’t want to leave, even though her relatives and friends are begging her to come home for a visit. Instead, she is trying to learn everything she can, with the hope that that she, with the help of her sister and parents, will be able to start another “school of the prophets” in the countryside outside Quito. Like us, she wants to see many more places that can receive and educate young people! Our family at Pra Del Tor. We feel at times like our ax head has fallen into the river, and there seems to be no way to advance. 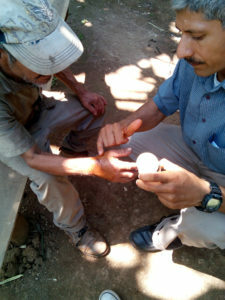 As Pra del Tor expands, we need more bedrooms, bathrooms, transportation, utensils, tools—the list can go on and on like the deep waters of the Jordan. Oh how we need the faith to cast that stick upon the waters and expect a miracle! Please pray for our ministry and these dedicated young people who are preparing to turn Ecuador and many other countries upside down as they are touched by the Holy Spirit in the latter rain. Let us finish the work and go home; we have been here too long already. Early this year we started another mass distribution of The Great Controversy in Ecuador. Over 7,000 books will go to all businesses and government offices. The young people will all be involved in this work. We will keep you posted as the work progresses. Maranatha! By Laurie Orellana. familyorellanaec@gmail.com. Support for Pra del Tor may be sent through Mission Projects International, PO Box 59656, Renton, WA 98058, marked “Ecuador.” To donate online, visit www.missionspro.org. Francis, a brother from the East Sepik province of Papua New Guinea, was brought up in the Assembly of God Church. He was very faithful to the church and served them as a musician. He has a good education and works hard for a big company in the town of Kimbe on New Britain Island. Not long ago he met a widow named Agnes who lived in Tiauru. Agnes eventually left Tiauru and began living with her older sister in Kimbe. It was there that she met Francis and they married. One day, Daniel, one of our church members, was discussing business with Francis and ended up talking about health. Daniel told Francis about the health message. Francis was convinced and he went home that day and told Agnes about what he heard. They both decided to worship with our brethren in the Gavuvu home church one Sabbath. That Sabbath was the turning point in their lives. They found the present truth which eventually led them to take their faithful stand with us and uphold the truth. They began worshipping with us in Gavuvu, both learning new truths that they had never known before. They were very blessed. Eventually they left Kimbe and moved back to Tiauru where they both continue to worship with us. Another testimony comes from young Sophia who lives with her family on the Barema oil palm settlement. Sophia has only one hand because her other hand had to be amputated when she was still a baby. But she is a very strong girl and is able to do her work using only her right hand. She is a very good farmer and plants gardens of cabbage and peanuts, among other produce, in order to support herself and not be dependent on her family. The Barema laymen church hosted a health evangelistic meeting and invited me to be the guest speaker. It was an open air meeting and many people from different Sunday-keeping churches attended the program. One of them was Sophia. Every night she heard the health message that was presented with pictures in a slide show and was converted to the present truth. The first Sabbath after the meeting she joined us in worship and found out that the Sabbath is the true day of worship. She left her Sunday-keeping church and fully made her decision to stand on the Lord’s side. She is now in baptismal class, studying more truth in the Barema church. Sophia said that when she is baptized and fully knows the truth, she will go to her village in Hagen and establish the work there. Her whole family worships on Sunday and do not know the saving truth, so she wants to go and bring them over to the safe side. Please pray for young Sophia. She is a faithful young girl and is very serious in her new found faith. Agatha is a young mother from Chimbu Province. She also lives in the Barema community and had breast cancer. She sought medical treatment, but it didn’t help her. She had to accept that she would die. Finally, she heard about our group of medical missionaries in Barema and came seeking help. By God’s grace, our medical missionaries enrolled her into their treatment program and, with their assistance, she was healed through faith. After her healing, Agatha knew that the true church of God was teaching the health message, which she had never heard in her Sunday-keeping church. She told her husband, who never attended church, “God has proven His power in my life. I should have died, but God had a plan for me to hear the present truth and be safe in Heaven.” So she took her stand and attended baptismal class. Today she is an active church member and her testimony is a great shining light to the Barema community. She always has a smile on her face because she should have been in the grave, but instead she thanks God that she is alive. She faithfully lives the health principles. Marry is a mother from Goroka, Eastern Highlands Province. She used to be a Seventh-day Adventist, but does not live a healthy lifestyle and she and her husband face many health problems. One day, she and her husband decided to attend our church in Vilelo. There they discovered the health message, which they never knew before. They also took their stand and were baptized. When they began keeping the health principles they saw great changes in their lives. All of their disorders which had affected them so greatly, are now gone from their bodies. Dorothy is from Tolai, Indonesia. She is married to John, who is from Goroka and they live in the Vilelo oil palm settlement in Bialla. In 2014, Dorothy was affected by tuberculosis of the bone which left her paralyzed. She can’t walk but lies on her bed and has to have John clean her and take care of her. She slept for months, mostly on just one side and developed a big sore. Worms started eating her alive. Her husband and family knew that she would die. But they decided to take her to Bialla Health Center so she could be helped by the nurses and doctors. One of Dorothy and John’s sons also had tuberculosis so they took both Dorothy and eight-year-old son to the hospital. Both were admitted, but the nurses and doctors couldn’t help. Even the medication was useless. The ward in which they slept stank because of Dorothy’s wounds. Flies flew in and out and all the nurses and patients complained about her. When Dorothy knew that she and her son would die, she couldn’t talk because of crying. The doctor decided to send her back home to die. The next day, while still in the hospital, her son died. What a heartbreak to her and her husband. They wept and Dorothy knew that she would die next. The next day, the doctor sent her and her son’s body home. They buried him and Dorothy stayed at home, waiting to die. It was at this point that our medical missionaries heard about her and visited. They prayed with her and gave her hope that she must accept Jesus before she died. They helped her with simple remedies including herbs and hydrotherapy. Praise God, she began to be healed. The medical missionaries continued working with her for months and she was finally completely restored to health and started walking again. She can now walk a mile to the Vilelo church to worship on Sabbath. She now comes every Sabbath and is receiving Bible studies and is ready to be baptized. She came to our campmeeting and enjoys feasting on the Word of God. She smiles because she found the truth which she had never known before and would have died but God saved her life from her worse-than-dead body full of worms. She came alive to serve our God. Please pray for Dorothy; her testimony shines out as a light in the community. Many people have decided to come and find out what really healed her and we direct them to the saving truth. By Pastor Michael Loko. Pacific Lay Members Association, PO Box 103, Glasshouse Mts., Australia 4518. To donate, contact John A. Wolff: johnw@tsn.cc. “Thy shoes shall be iron and brass; and as thy days, so shall thy strength be.” Deuteronomy 33:25. This is a most precious and glorious promise from God that I have claimed as the days pass, here in Senegal. With so many changes going on in the world and the difficulties of our neighboring African countries, there are times when we are tempted to be afraid but we must remember that the promises of God are sure and that He has us in hand. These promises have sustained me here before, during, and after the Ebola scare. It is one thing to hear about Ebola in other places but when it crosses the border, that is when the rubber meets the road! What will we do if Ebola comes our way? Death becomes something close and perhaps inevitable. But God has shown me that He is closer and His grace and mercy are like Him: ever-present. Difficulties will come but our loving and kind Heavenly Father will give us shoes and enough strength to go through them all. When the news arrived that a young man infected with Ebola had come into Senegal, fear and panic gripped the population. People were enraged that he would sneak into the country knowing that he was sick and also because he did not tell his extended family whom he was visiting that he was sick. It is truly in a crisis that character is revealed. Calls came from several quarters to kill him, and neighbors wanted to burn down the house where he lived. People became suspicious of foreigners and the tension was palpable. Hand sanitizer bottles were put at the entrances of public places and people stopped greeting each other with the traditional handshakes and kisses. At church, the normal greeting after the service was suspended and remains so until now. Even communion was suspended. Relations between Guinea and Senegal became strained and the Senegalese government closed its borders with Guinea. Fortunately, the young man recovered and no one else became sick. Senegal returned the young man to Guinea and everyone relaxed somewhat. Still the danger is not past. Mali has had a few Ebola cases linked to a Guinean marabout (religious leader) who died in October. Since then Mali has refused to close its borders with Guinea and, to date, Senegal has not closed its borders with Mali. Mali is land-locked and relies on the ports of Senegal, Guinea, and Ivory Coast for a lot of its imported goods. Also closing the border would be a violation of an important Malian principle of diatiguiya (JAH-tih-GEE), which is the belief that hospitality to friends and even strangers is obligatory. Nurse Jean Sambou (with stethoscope) and Lala (on right, in white shirt) doing blood pressure screenings. On the brighter side however, this gave us an opening to talk to people, both in and out of the church, about God and faith, the last days, and the health message. Crisis reveals character but it also opens a field for labor. People are looking for answers and we have answers for them. I did presentations at church on many different topics including how to improve the immune system, the dangers of fear, the blessings of faith and trust in God, the necessity of honesty, and the importance of sanitation and hygiene for the prevention of disease. Many people have lost their lives because other people were not honest about their exposure to the disease. In the village, we recently held health presentations that were very well received. Jean Sambou, the young nurse who helped me when I had dysentery came for another visit and did the presentations in Wolof. We also did blood pressure screenings one Sunday morning. During the screenings, we found several cases of hypertension in women. I will do another presentation just for the village women on managing stress in January. Jean got sick with typhoid fever right before he left to go back to Casamance but has since recovered, praise God. Otherwise, life continues in Senegal. I have been spending a lot of time in Dakar recently because of employment obligations and there is a rich field of labor here. When I am in Dakar, I stay with my oldest daughter and her family. The health message has been a blessing to the downstairs neighbors who have had a few health challenges, as well as the night guard of the apartment building next door. I always keep charcoal on hand because over the years I have found that inevitably someone will need it. One morning, I saw the neighbor’s young son lying on the floor near the front door of his apartment as the family was preparing to go out. When I asked his mother what was wrong, she told me that he had been vomiting and said his stomach hurt. I ran upstairs and brought down some charcoal for him. Mom took it with her to give him when they arrived at their grandmother’s house. It worked and a few days later the father stopped me to say that the baby was constipated and asked what they should do. Another time, my daughter was talking to the night guard and realized that he didn’t look well. She asked him if he was sick and he told her that he thought that he had dysentery. She came upstairs and asked me for charcoal. She put some in a cup of water and gave it to him to drink. She also gave him some in a bag. He was happy to see it because he had used it when he lived in Russia but didn’t know the name of it in French. I talked to him a few days later and he said that he felt much better and thanked me again for the charcoal. 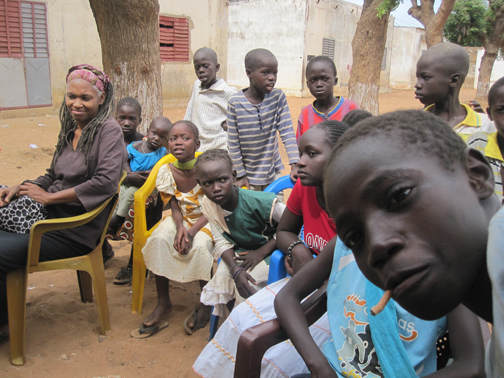 The author (left) with village children. A former colleague opened a school in Dakar and asked me to teach a couple of classes for him. I accepted because there are still many things to finish at the outpost. I never look for work, so I assume that when someone calls me God has provided. Now I see that I am being introduced to a totally different kind of student—young people from Guediwaye and Pikine, the very popular parts of the Dakar suburbs. One class was comprised totally of young men who asked me to change the time of a Friday afternoon class. I told them that I could not, which led to a discussion of the Sabbath, Adventism, dietary laws, and the Koran. I look forward to sharing more truth with this class because they seemed genuinely interested, especially when I told them that keeping the Sabbath holy was also required by the Koran. Please pray that God will give me wisdom and the right words to say when our class meets again. Please continue to pray for our water situation. Things just seemed to have stopped for several months. As much as I tried, and with all the phone calls and visits with officials I made, nothing moved forward. It has been frustrating, but in the midst of it all I keep holding on to the promises of God. Several weeks ago, I believe that God gave me a nugget of hope. One night I dreamed that I could not drive on the road because it was all dug up and I had to drive on the side of the road in order to leave the house. I was confused when I woke up because I did not understand. I now believe that God was showing me that water is coming and that the road was dug up for the pipes. Last week, I ran across the project manager who explained to me that the sub-contractor had some problems and had stopped working. Now the company is back to work and should be finishing up their contracts. This is good news but I am still praying for the Lord’s direction and intervention. Man’s word is one thing but the Lord’s word is above all. It is my sincere hope that we all may come to that place of absolute faith and trust in God that will help us hold on to Him no matter what—tribulation, distress, persecution, Ebola, you name it—that in all these things we can be conquerors through Christ Jesus our Lord, and that as our days are, in this sinful world, our strength shall be. God bless and keep you all! By Deborah Ndione. Senegalhealthproject@live.com. Support for this work can be sent through Mission Projects International, PO Box 59656, Renton, WA 98058.